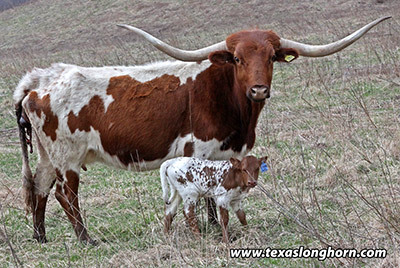 DOB: 4/1/2010; Sire: Drag Iron; Dam: Debra; Color: Red; Service Sire:Tibbs (over 80"); A Drag Iron daughter with her 8th calf. Notice her maternal side is 100% of the historic Tri-W line. Weight 1225 lbs. 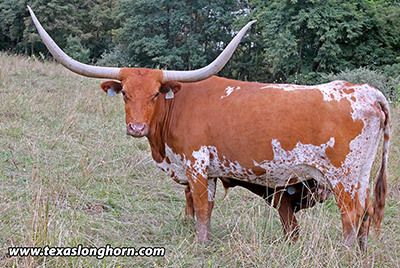 Horns T2T 73.63." Her better known progeny include Clear Steel, Jumanski, Steely and Steel Tip. Her Tibbs steer holds the feed lot gain record at DCC of 4.1 lbs per day gain for a 120 day feed out. Heifer born 4-9-19 by Tibbs (over 80" see reference sires) Test neg Johne's. DOB: 4/22/2016; Sire: Reckon So; Dam: Rodeo Time; Color: R/W; Soon to be 3 years old and already raising her second calf. Only at DCC can a genetic prize like this be available. 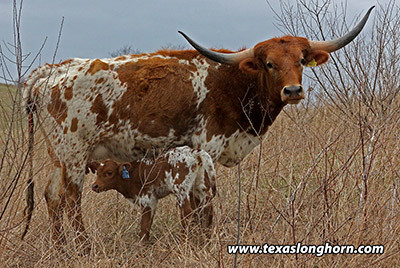 An own son of Hunt's Command Respect calf at side born 3-29-19. Look at her value pedigree. Not available at any auction. DOB: 4/9/2013; Sire: Top Tool; Dam: Te Jube; Color: R/W unln; A big mid 70" cow with a real value pedigree including Shadow Jubilee. She is a grand daughter of Top Caliber & Tempter - two great consistent sires of 90" & more. 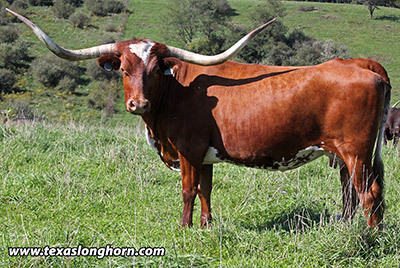 She is big, thick, and horns twisting like a Mexican pretzel. Build a business around her. She has future opportunities into the 90"s. Heifer at side by Drop Box born 2/24/19. Johne's test neg. DOB: 3/29/2013; Sire: Jolter; Dam: Sequoia Mark; Color: W/R Spk; Sequoia Jolt is right in the middle of where a good herd should be. Her sire was one of the tallest bulls ever bred at DCC. One horn tip kebotchulated. Horn T2T calculated by adjustment. Bull calf at side born 4-10-19 by Cut'n Dried (see refereence sires), test neg Johne's. She will catch your eye, even with poor eye-sight. Residential delivery at a seperate fee. 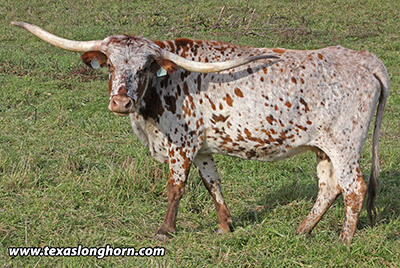 DOB: 4/14/2012; Sire: Jubal Jangler; Dam: Marquee; Color: R/W pnl; What a sweet pair! For those who love great pedigrees, some will want to lick the plate here. Heifer calf at side born 3-29-19 by Non Stop Notice over 90" Shadow Jubilee in this pedigree. Her dam is a half sister to Jamakizm. DOB: 4/14/2008; Sire: Superb; Dam: Special Blend; Color: R/W; Love the tiny Super Bowl head and large body. She has the "look." Ten big calves in 10 years. She is a pasture reproduction practitioner of the highest sort. Always finds the bull without GPS. No offers like this on TV. However with an additional fee she comes with a close friend herd sire. Heifer at side born 5-10-19 by Non Stop. Johne's test neg.